Miltonvale Park – Events All events at Milton Community Hall –unless noted. Mondays and Fridays at 10:00 “Coffee Club” – Drop in to share some coffee, treats and visit with neighbours. Admission by donation of coin or snacks! Everyone welcome. Summer Card Parties - Thursday Nights throughout June-September, beginning at 7:30 p.m.
June 10-23– PEI Mutual Festival of Small Halls -Stay tuned for details. June 12- PEI Mutual Festival of Small Halls - "Folk Tracks" beginning at 7:30 p.m.
Sunday, July 1 – 12 noon -2:30. – Canada Day Celebration – Free barbeque and music. Miltonvale Community Park -413 Sleepy Hollow Road. 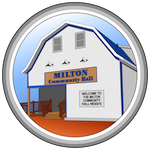 (Rain location – Milton Community Hall. If raining, the time will also be delayed, to 2-4 p.m. due to Church services at the hall). Monday, July 16 -Strawberry Social - hosted by the North Milton WI. 6:00- 7:30 p.m. Adults $10. Tuesday, August 21 - Blueberry Social – Hosted by the St. John's Anglican Church Blueberry Social at the Milton Community Hall 5:00-6:30. Sandwiches and blueberry desserts. Apple (and other fall desserts) Social - Thursday, October 4th from 6-7:30 p.m.
Christmas Craft Fair -Sat., November 24, 2018 9:00 -3:00 p.m. Admission $2 for those over 12. Hall- 902-566-3154 miltoncommunityhall@gmail.com miltoncommunityhall.ca Check online!